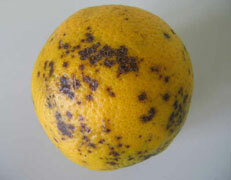 Early disease detection and management are essential to ensuring continued viability of the U.S. citrus industry. Rapid communication of new diseases, significant outbreaks, and accurate information are vital. Many diseases are difficult to distinguish from one another or disease symptoms mimic disorder symptoms. Images and description of diseases are helpful in making a correct diagnosis. This tool contains fact sheets, a glossary, an image gallery, and an interactive key. Please see the How to Use page for detailed instructions on how to use the key. The image gallery has a filter, which allows the user to use certain terms such as plant parts to sort through images in a more efficient manner. Several terms can be selected at the same time. The fact sheets give a detailed description of the disease or disorder and provide thumbnails of the images of the disease or disorder being described. By clicking on a thumbnail, the image enlarges for better viewing. The glossary provides definition of terms used throughout the fact sheets. By hovering the mouse over a term on a fact sheet, the definition will appear, without having to click on the term. By clicking on a term, the browser directs the user to the glossary window. The selected term appears on the top of the screen. Citrus Diseases is one piece of a multi-tool resource initiative to provide an accurate identification resource for pests and diseases of cultivated citrus in the United States. The resource includes three individual identification tools: Citrus ID, Edition 2 , Citrus Diseases , and Citrus Pests. All three tools are packaged into the comprehensive Citrus Resource.